For ADIVAN it was necessary to design equipment for full satisfaction of the media production process. Anything less would have been cutting corners. Moreover it was the only real way of ensuring that all components satisified ADIVANs rigorous quality standards for reliability and performance. In fact, the ADIVAN Development Team’s uncompromising approach to design has led to a number of innovative equipment. testing to one more phase of the HD-DVD manufacturing process. production process. By developing equipment we flow our production experience directly into the design of new testers and easy understandable software. 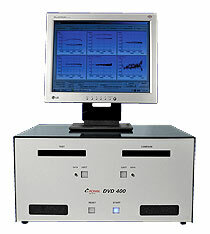 The broad range of quality control equipment is used in the data media replication industry world-wide. For further information, please download our product information sheet.